Chennai: Union Agriculture and Farmers Welfare Minister, Radha Mohan Singh on Monday expressed hope that under the leadership of Professor M. S. Swaminathan, the agriculture and food security will continue to be sustainable in the coming years in India and the government will be successful in doubling the income of farmers within the given target. He also appreciated and felicitated Professor M. S. Swaminathan, the recipient of the World Agriculture Prize at an event in Chennai. 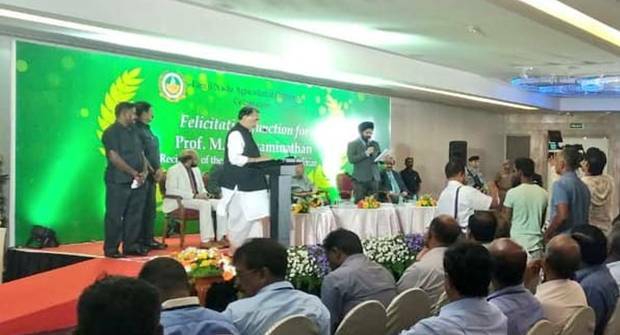 Addressing the gathering in Chennai, He said India is today not only self-sufficient in food grains but is also an exporter due to the efforts of Prof. M. S. Swaminathan, the architect of India’s Green Revolution. He further added that that under the ‘Green Revolution’ programme led by Prof. Swaminathan in 1960s and 80s, wheat and rice seeds with better yields were planted in the farmers’ fields. This revolution made India self-reliant in foodgrain in less than 25 years thereby bringing glory to Swaminathan as the scientific leader of India’s ‘Green Revolution Movement’. Singh further added that Prof. Swaminathan has won many awards and recently won the World Agriculture Prize conferred by the Indian Council of Food and Agriculture (ICFA) for his research on genetics, cytogenetics, radiation and food and biodiversity conservation. He also praised the role of ICAR in achieving the goal of doubling farmer’s income by 2022. Minister asserted that the Prime Minister Narendra Modi led government, after taking over in 2014, started working towards all-round development of the agriculture sector. It has always been the government’s vision to not only fill the stock of agriculture commodities but also to enhance the income of farmers. In this context, the Dalwai Committee was constituted for doubling farmers’ income. The government is working with a concrete strategy in line with the recommendations of the DFI committee. To reduce the cost of production, the use of soil health card and neem-coated urea and schemes related to “more crop per drop” are being targeted and successfully implemented. Agriculture Minister elaborated upon various schemes or initiatives taken by the government to improve the agricultural and socio-economic conditions of farmers and said that for the first time in 2014-15, the government launched a comprehensive scheme to promote organic farming in the country. Under this, the Paramparagat Krishi Vikas Yojana (PKVY) is being implemented and Mission Organic Value Chain Development for North Eastern Region (MOVCDNER) is also being implemented as a central scheme for the northeast region considering the possibility of organic farming in this part of the country. And Singh reiterated that government’s commitment to ensure remunerative price to farmers for their produce. The goal of integrating 585 mandis with e-NAM has been achieved till March 2018. By 2019-20, additional 415 mandis (200 in 2018-19 and 215 in 2019-20) will be integrated with e-NAM. Besides, the government started the Pradhan Mantri Fasal Bima Yojana (PMFBY) from Kharif 2016 to eliminate the risks associated with agriculture. In order to bring self-reliance in the area of pulse production, 150 seed hubs have been set up in the country, resulting in record production of 22 million tonnes of pulses. In order to increase the income of small and marginal farmers of the country, 45 integrated farming system models have been developed, in which special emphasis has been given to livestock farming, poultry rearing and horticulture. And also, He shared that the Rashtriya Gokul Mission has been initiated for conservation and promotion of indigenous breeds. Under this, a sum of Rs. 546.15 crore has been released to the states till March 31, 2018 & called the government’s decision of implementing the hike in MSP by at least 1.5 times of all Kharif 2018-19 crops as historic thereby fulfilling the promise made in the budget of 2018-19.